The study prehistoric ethnogenetic processes based on the deductive approach , widely used in engineering to solve technical problems, where based on the general laws of physics made design of specific mechanisms and machines. In accordance with this approach, based on expected patterns of relationships related languages using my own special graphical method defined place in the individual languages as separate elements in the overall structure of linguistic formations – families and groups. The graphic-analytical method allows research the origin and development of languages in prehistoric times by means of available lexical material collected from dictionaries of various types. The idea of the method consists in geometrical interpretation of interrelations between cognate languages on the basis of quantitative estimation of mutual linguistic units in pairs of languages within one language family or group. The larger cognation of languages is usually connected with the greater amount of mutual linguistic units and these are just mutual words that are most suitable for statistical processing. This method is based on a supposition that the inverse proportionality exists between the amount of mutual words in a pair of languages and the distance between natural habitats where these languages were formed. To put it simply, the closer to each other the carriers of two cognate languages lived, the greater amount of mutual words they had in their languages. It is clear that only old words are to be regarded which a person could use in prehistoric times, but not those which arose up later at higher levels of civilization development. It is not easy to determine the old words, possible though. There are various methods for this purpose. Etymological Table Database for the different language families, which were used in the studies, is submitted on my site Historical Macrolinguistics. Hence, having chosen the needed words from all the languages of the family under research we proceed to estimate. At first, a common lexical stock should be defined, which is one of the characteristics of the linguistic community, but does not reveal any information about the level of cognation between different languages, therefore should be excluded from the calculation. The rest of the words can be common to two or more languages, but we count the amount of the mutual words in pairs regardless whether they exist in other languages or not. After such a calculation in all possible pairs of languages the graphic model of cognation is constructed. The graph reflects the location of areas where each of the languages was spread on the common territory of the whole language family. Each area corresponds to a tight accumulation of knots of the got graph. This accumulation is formed by the ends of ribs (segments) with length inversely proportional to the amount of mutual words in the pair of languages. The amount of ribs is equal to the amount of pairs of languages, and the amount of knots is one unit less than the amount of languages. The process of the graph construction is simple and only needs some elementary knowledge in geometry. As a next step, we have to find a suitable place for the received graph. The suitable territory should consist of areas with more or less distinct natural boundary-lines such as rivers or mountain ranges. Natural barriers complicate contacts between the people in the areas and, accordingly, prevents from exchanging with new arisen words that results in the split of a primary language. The more distant one from another the situated areas are, the larger amount of differences arise in the languages of their inhabitants. There are very few places on the earth’s surface with accumulation of natural areas, which we will name ethno-producing areas therefore search for them is not complicated. A lot of people think that any kind of graphical model can be placed in any kind of place, but this is a fallacy. The same as the two nets, formed of triangles and squares, cannot be superposed, it is similarly impossible to superpose a graphic model upon an incongruous place in a map. Thus, the fact of correct placing the graph in a map is meaningful in itself. A large group of Mongoloids stayed in the Near East and the Caucasus, populating suitable for life valleys. There were formed the Sino-Tibetan languages (see. Map below). Obviously they can be associated with Upper Paleolithic culture common in places (40-30 ths. уears ago). The map shows the areas of the formation of the Tibetan, Burman, Kachin, Chinese, Kiranti, Lepcha, and Lushey languages. Meanwhile, a race Caucasians was formed in North Africa, whose representatives began to settle in Europe via the land bridge that once existed on the place of the Gibraltar and Tunis Straits. Obviously at the beginning of the Mesolithic they appear in the Near East and displace people out of the Mongoloid race into Central Asia. Newcomers have a common language, which eventually split into six separate in the same habitats, where Sino-Tibetan were formed. These languages ​​are called Nostratic and include Indo-European, Uralic, Afro-Asiatic, Dravidian, Kartvelian and Turkic. Integrated graphic models of thesw six languages of the Nostratic superfamily allows you to define areas of their formation in Asia Minor and the Caucasus and around the three lakes nearby – Van, Urmia, and Sevan (see. Map above). Thereis at the center of this area the biblical Mount Ararat. The map shows the area as a hypothetical form of the previous North Caucasus language (arrows indicate the path of migration of carriers of the later Abkhaz-Adyghe and Northeast Caucasian languages). Obviously, at the end of the 6th mill. BC. a bulk of Nostratic language speakers to populate new territories. On the old ancestral home remained Kartvelians (ancestors of modern Georgians), and perhaps a small group of other ethnic groups. Semitic-Hamitic and Dravidians moved to the south, and the speakerso9f the Indo-European, Uralic, and Turkic proto-languages ​​alternately moved through the Derbent passage to the North Caucasus, and then gradually spread across the East European Plain, assimilated among the indigenous population, which, however, adopted more perfect alien language. Graphical models for the language of each of these three families allow us to find the territory of the settlements of their speakers and forming areas of next level languages. The whole territory of Eastern Europe from the Vistula to the Ural is divided by river network into several tens ethno-producing areas quite clearly. Indo-Europeans settled in the basin of the middle and upper Dnieper, and here in areas formed by its tributaries and tributaries of the Pripyat and Desna Rivers Indo-European dialects were formed, of which eventually evolved these languages: Greek, Italic, Germanic, Slavic, Baltic, Tocharian, Celtic, Illyrian, Thracian, Phrygian, Armenian, Iranian, and Indoaryan. Most of speakers of the Uralic proto-language was not reached the Ural and settled in the Volga basin. Such primary Finno-Ugric languages: Finnish, Estonian, Vepsian, Sami, Mordovian, Mari, Hungarian, Udmurt, Komi, Khanty, Mansi, and another two or three languages, which later disappeared, were formed on the space of the right-bank partof the Volga. That part of the Uralians, which has moved beyond the Volga to the north, had already no close contacts with its old relatives, so their language developed independently and has given rise to the languages, which are now known as the Samoyed. Ancient Turks have occupied the territory between the lower Dnieper and Don Riber, here Turkic language was also differentiated. At the beginning of the III millennium BC. the majority of Turkic tribes began to leave the ancestral home, gradually populating the large territory from the Carpathians to the Altai. 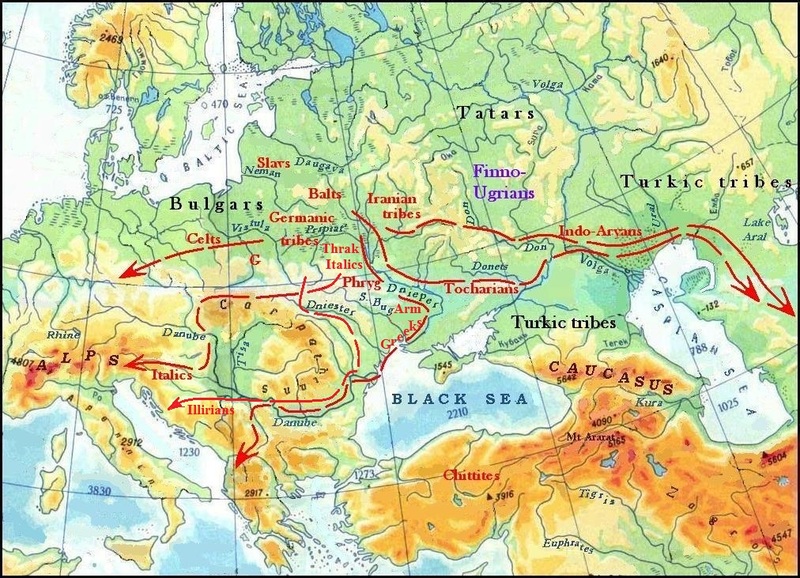 Those tribes of Turks (mainly Proto-Bulgarians), who crossed to the right bank of the Dnieper, assimilated Trypillians, began to colonize vast areas of Eastern, Central, and Northern Europe, extend the Corded Ware culture (see the map below). The Bulgars left traces of their migration in numerous place names (about 600 units), which were decrypted using the Chuvash language (see. Googlemap below). There are on the map rhombic signs mark place names of Bulgarish origin. Violet signs reffer to time of CWC created by the Bulgars. The sites of CWC are shown by blue asterisks. Green asterisks mark sites of Fatyanovo culture. Rosa signs refer to Scythian time. Many lexical parallels between the Chuvash and German (see. the cection Chuvash-Germanic Language Connections) can be explained by two reasons. The Urheimat of the ancestors of the Germans, which we call the Teutons, was in the Volyn Region of Ukraine, and Bulgars populated the neighboring territory of Galicia. Thus between them could be mutual linguistic influence. When the Teutons in the process of migration reached Central Europe, they settled among the Bulgars, who were there from the time of the Corded Ware culture, gradually assimilated them but borrowed some Bulgarish words. Simultaneously with the movement of the Bulgars to Central Europe other Turkic tribes populated the Northern Caucasus and migrate across the Volga River. They, passing Kazakhstan and keeping an order, due to location of the primary areas of settlements, moved to Central Asia, Siberia, and the Altai (see. Map below). Those Turkic tribes, who came to the Altai, got a contact with the native speakers of the Mongolic and Tungus languages. The more rich and developed Turkic languages ​​have a big impact on aboriginal languages, which were largely engaged at hunting and gathering, that were standing still at a fairly low level of development. As a consequence, the Mongolic and Tungus languages, as well as genetically related to them Japanese and Korean, have a certain number of common features with the Turkic. This gives reason to unit them all into one so-called Altai language family, although the Turkic languages, as we have seen, are genetically do not belong to it. After the majority of Turks have left their lands between the Dnieper and Don Rivers, the movement of the Indo-European tribes began too. The Illyrians and Greeks moved to the Balkans, and the Italics (the ancestors of the Falisci, Osci, Umbri, Sabines, Latins and others) after long wandering finally settled in the Apennine peninsula. The second wave to the Balkans was consisted by the Phrygians, Ancient Armenians and Thracians (ancestors of the Albanians). The Indo-Aryans together with the Tocharians reached Central Asia, and then advanced to the Hindustan. The Slavs having their Urheimat on the very north of the Indo-European space, moved to the west, but stopped at banks of the Vistula River, while their southern neighbors Celts went further in Central Europe. It should be noted that the population leaves their homes never completely, but the remaining part is subjected to assimilate by more numerous newcomers, although the language of the indigenous population leaves traces of its influence on their tongues. Such influence of language substrate on ethno-producing areas significantly accelerate the process of differentiation of a common language of newcomers. Therefore, when the Germanic people, Balts, and Iranians took habitats left by other Indo-Europeans, they were mixed with the previous population. The Germanic people occupied areas of the Celts, Illyrians, Greeks, Italians, and their common Germanic language was quite soon divided into five dialects from which later evolved Gothic, modern English, German, Dutch, Frisian, and North Germanic languages (Swedish, Norwegian, Danish). At the same time there was a process of differentiation of Iranian and Baltic languages. Migrations of the Indo-European tribes are shown in the map below. The tribes of the Balts, Germans, Iranians, and Thracians stayed near their Urjeimat, they occupied empty areas. Some time the Armenians and Phrygians are still present on the left-bank Ukraine (see the map below). In the middle of the first mill. BC. most of the Iranian tribes migrate in turn to Central Asia. In Eastern Europe, stayed the ancestors of Baluchis, Kurds, Ossetians, Gilaki, Talysh, and possibly Mazanderani people. The Kurds passing to the right bank of the Dnieper River, settled POdolia. Later, one portion of them moved to Central Europe, where they became known in historic times as Cimbri.The second part has moved to the steppes of Ukraine. Ossetians stayed in the upper reaches of the Don till the Scythian times. 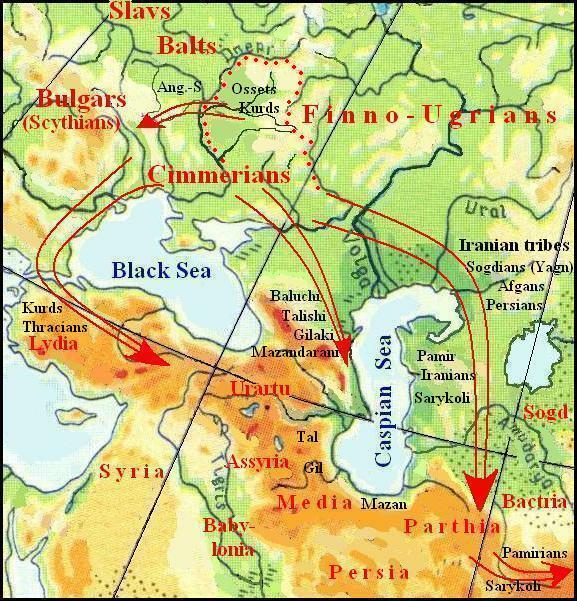 The rest of the Iranian tribes who lived in Eastern Europe, became known under the name of Cimmerians. They were joined by those Kurds who migrated into the steppes. The historically accurate times Cimmerians inhabited the Azov and the Black Sea steppes, and left traces of their stay in the archaeological sites, which are united into a Cimmerian culture. Over time, they were driven out by the Scythians in the Asia Minor. The Scythians were ancient Bulgars, who two millennia stayed in Galicia, where they became the creators of Komarovo and Vysotsk cultures. At the beginning of the first millennium BC. they began moving in different directions. Most of them moved to the east, reached the Dnieper River and along the Vorskla River switched to Left-Bank Ukraine. They can be connected with Chernolis culture that has developed as a synthesis of Vysotska and Bielogrudov ones. Of all For-Scythians cultures, it was the most common in Ukraine (see the map below). Thus, the Scythians did not come from the east, as is commonly believed, but from the west. Archaeology and linguistics confirm this idea. There are marked on the map place names of Bulgarish origin by deep-red signs, by azure – Anglo-Saxon, by pink – Kurdish, by red – Mordovian, by green – Ossetic, by brown – Hungarian, by orange – Greek ones. Light-yellow colour refers to place names having different explanation. Violet marks Bil'sk Hillfort which could be an ancient town of Gelonos. More toponymic research is discussed in the part "Prehistoric Place Names of the Central-Eastern Europe.". Finno-Ugric tribes remained outside of the ways of great migrations, but gradually moved northward in the order, which was determined by the location of their habitats in the ancestral home. For example, the Sami (Lapps), who held the extreme northern area of total Finno-Ugric territory, were the first in the movement to the north and are now the most northern Finno-Ugric ethnic group. As the ancestors of the Mansi had their ancestral home in the far north-east and now the Mansi occupy the same position in the whole modern-day Finno-Ugric space. Approximately the same can be said of other Finno-Ugric peoples, with the exception of the Hungarians. Their homeland between the rivers Hopper and Bear lying near the tracks of the great migrations, so the historical fate brought them to Central Europe. Since the rest of the Finno-Ugric peoples were not went in the distant stranger, no one of them had possibility to occupy a large empty area, so the Finno-Ugric languages ​​were not as widely differred as the Indo-European ones. Some languages ​​have retained their integrity, while others are divided only to a small number of close dialects or languages. And finally, the Slavs. The Slavs, who for a long time dwelled in a fairly compact area, also a long time kept the unity of their language. And even after the differentiation the Slavic languages are more similar to each other than, say, Germanic, which differentiated much earlier. Map 12. Settlements of Slavic tribes in the end I mill. BC – in the beginning of I mill. AD. Bodr – the Bodriches, Bulg – the ancestors of modern-day Bulgars, Br – the ancestors of Belorussians, Cz – the ancestors Czeches, Lus – the ancestors of the Lusatian Slavs, Lut – the Lutiches, NR – the ancestors of speakers of the northern Russian dialect, P – the ancestors of Poles, Pom – the Pomorian Slavs, SR – the ancestors of speakers of the southern Russian dialect, Slv – the ancestors of Slovenes, Slvk – the ancestors of Slovaks, S/H – the ancestors of the Serbs and Horvats, U/Т – the ancestors of the Uliches and Tivers (? ), Ukr – the ancestors of Ukrainians. The division of the Slavic languages occurred at the beginning of the new era, when the Slavs settled the whole former Indo-European territory. For the most part, they are layered on the aboriginals of Baltic origin who changed here the Germanic and Iranian people have already had their own separate languages. Different substrate very accelerated division of Slavic languages, so the age of each of them has now about eighteen centuries. In this short presentation many details are ommited, which themselves do not seem significant, but fit well into the overall picture is served here, added to it completeness and reliability. In general we can say that empirically constructed models of language cognations correspond geomorphological features of the earth's surface and are confirmed by linguistic and extralinguistic facts. Thus, in this case philosophical doctrine verum et factum covertuntur (the true and made matching) has its ocular reflection.